Manuel Pellegrini says every West Ham player has their price, but claims a deal will only be agreed if it is "good for the club". 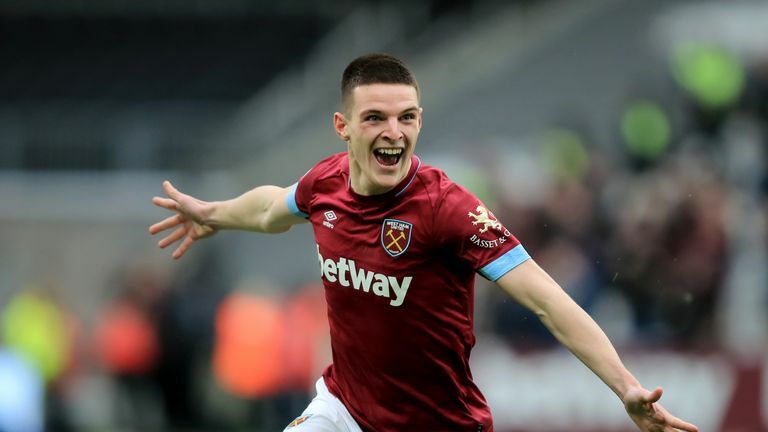 Hammers midfielder Declan Rice has reportedly attracted interest from a host of top clubs, having enjoyed a superb season, establishing himself as a first-team regular under Pellegrini and earning his first England cap last week. In response to a question about possible interest in the 20-year-old, Pellegrini said: "In that case (of interest from teams) as always it's just a matter of price. "Maybe the big teams decide to pay an important amount of money. "If it's a good deal for the club and it's a good deal for the player and he improves with his career, they can do it." Rice pledged his future to West Ham in December, signing a long-term contract extension until 2024. Naturally a centre-back, Rice has thrived since being deployed in a midfield role by Pellegrini and has featured 32 times in all competitions so far this season. Pellegrini added: "I think that he must continue doing exactly what he's doing now to work in the same way, to have the same mentality. "He knows that he must improve, that's why he's always listening and learning. So if he plays more games with better players, of course, he will continue improving." Ahead of Saturday's home match against Everton, Pellegrini also revealed striker Andy Carroll is continuing to undergo tests on his injured ankle. "Andy Carroll is doing a lot of different medical tests to decide what he must do with his ankle," he said. "We'll know more about that when he's finished doing all the different examinations with different doctors. "The players that have long (term) injuries, (Jack) Wilshere, (Andriy) Yarmolenko, Carlos Sanchez continue with their recovery."